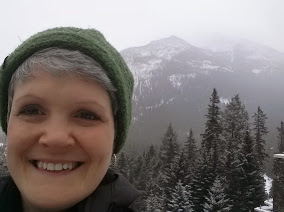 Susan Grabowski (pictured, at right, visiting Banff National Park in Alberta, Canada) began her career at Landmark College over four years ago when she moved to southern Vermont. She started out in the Office of Transfer and Career Services and is now the Director of Short-Term Programs. Landmark College's short-term programs are designed to support the academic growth of students who learn differently, serving high school and college students who may or may not have a diagnosis of a learning disability (such as dyslexia), ADHD, or autism spectrum disorder (ASD). Landmark has invested in me, and it's only fair to return that favor. That’s why I call it ‘giving back,’" said Susan. Susan lives in Putney, Vermont, the same town as Landmark College. “I love it here! Putney is a great little town, full of friendly people,” she said. She likes living in Putney because she is close to the College, and because Putney offers small town culture and a plethora of opportunities to take part in the community. When she is not at work, Susan enjoys cooking, hiking, snowshoeing, and just being outdoors. In the winter, she participates in the Putney Conservation Commission’s animal tracking program. Susan will start her fifth year at Landmark College this fall, and she looks forward to being a longtime supporter.